The launch of a spacecraft is fundamental to all space activity. As a rocket flies it loses mass, because most of its mass is fuel (pure hydrogen and oxygen) that provides the propulsive force. 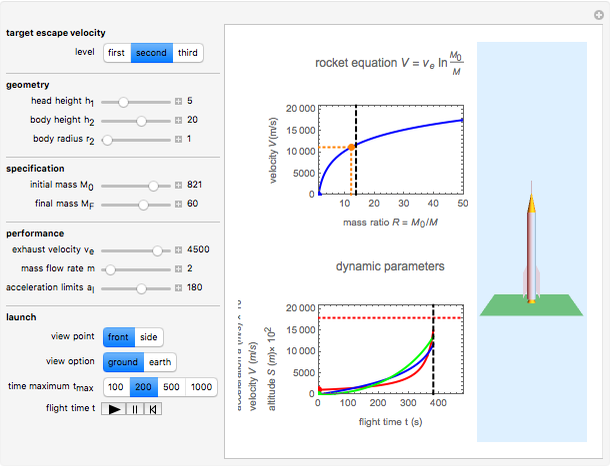 This Demonstration shows the dynamics of an ideal rocket from launch time to measured burn-out time, based on Newton's laws and Tsiolkovsky's rocket equation. 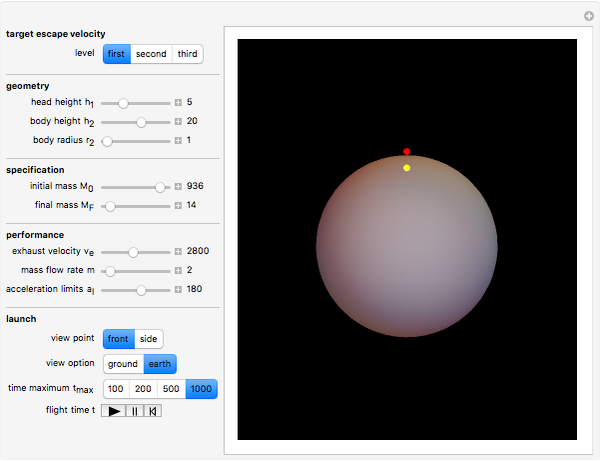 Specify the rocket parameters and launch with the trigger. is the efficient exhaust velocity, constrained within a range 2500-4500 , using today's liquid‐fueled rocket chemical technology. is the initial rocket mass. is the current or final rocket mass; decreases during flight until all the liquid fuel is burned out. is the final rocket mass, usually regarded as payload. is the mass ratio, , which is usually in the range from 3 to 8; 14 is difficult to achieve. is the mass flow rate, which depends on rocket engine design and specification; it indicates the rate at which the mass of the rocket is decreasing. Also called "specific impulse". is the rocket flight time, , which is the fuel burn-out time or the maximum flight time. 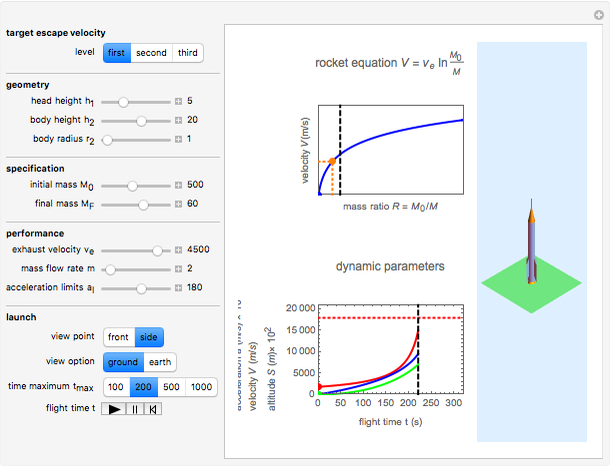 J. Peraire, "Variable Mass Systems: The Rocket Equation," MIT OpenCourseWare, 2004. M. J. L. Turner, "Newton's Third Law and the Rocket Equation," Rocket and Spacecraft Propulsion, 2nd ed., New York: Springer, 2005 pp. 14–17. M. J. L. Turner, "Launch Vehicle Dynamics," Rocket and Spacecraft Propulsion, 2nd ed., New York: Springer, 2005 pp. 115–144. M. Voshell, "High Acceleration and the Human Body," 2004. Frederick Wu "Launching a Rocket"